Beach weddings can be full of various challenges. Between the weather, the tides, and the uninvited onlookers, the setting can be breath-taking with skies and colors coming to life at a moments notice. A top choice for North Carolina beach weddings, it the small town of North Topsail Beach, with a population of a little over 750 people. A mostly rental community, you can likely find a house suitable for your needs and beach wedding desires. The wind earlier in this day had created havoc with the formals, basically whipping the bridesmaid's hair into a complete mess. About an hour after the ceremony ended, the wind had died down enough we ventured back out onto the shore. As the sun faded behind the island for the day, the sky lit up into a beautiful orange color. The bride had requested one image of them walking down the beach towards the camera, so we made the most of the opportunity to blend the two into one image by adding some off camera flash to the couple's right and timing the shot. 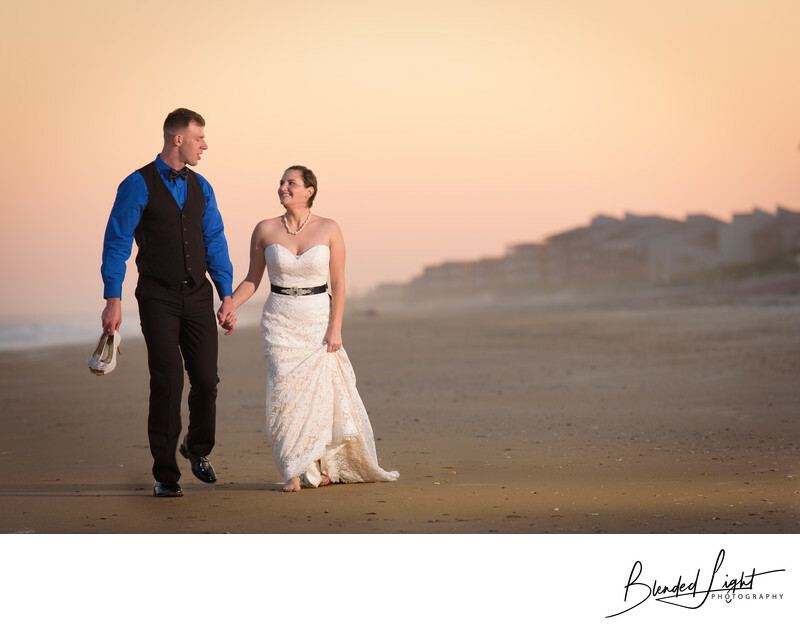 An empty beach coupled with the warm sunset and beautiful eastern North Carolina bride and groom made the image a standout among their portfolio of images and easily one of my most recognized. Location: 2008 Loggerhead Ct, North Topsail Beach NC 28460. 1/100; f/4.0; ISO 50; 175.0 mm.